Tashi and the Tibetan Flower Cure is the story of a young girl bringing together community and tradition to help her grandfather recover when he falls ill. In this BookTalk, Naomi C. Rose discusses Tibetan medicine and the power of community. Tashi and the Tibetan Flower Cure was inspired by a true story. How did you hear about this story, and why did you decide to create a book based on it? 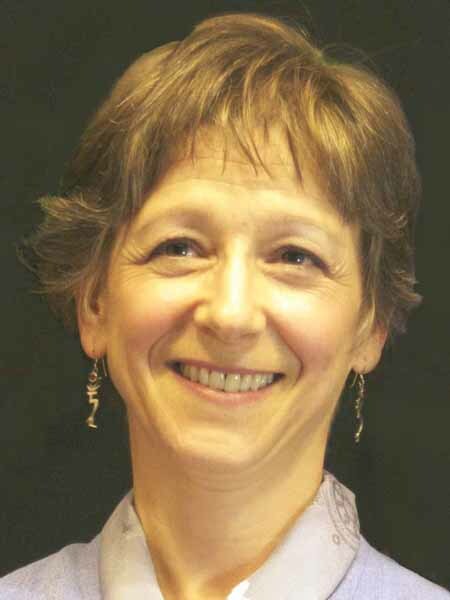 Naomi C. Rose: Several years ago my father had kidney cancer, and my mother emailed me a story titled “Downwind from Flowers” by Lee Paton. The true story was about a Tibetan man with cancer who healed from his disease thanks to the love and power of the community who gathered to participate in the Tibetan flower cure. I was struck by the beauty of this story and thought it would be very inspiring for children. I also immediately saw it as having great visual appeal as a picture book. 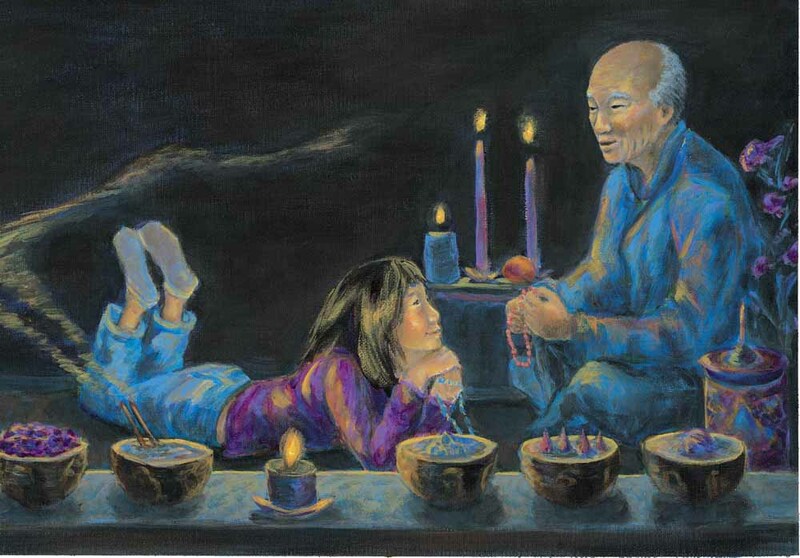 Tashi and the Tibetan Flower Cure addresses a difficult topic: the fear of losing a grandparent. What was the process of expressing this fear through your writing and illustrations? What were some of the challenges? NCR: It’s very important to me to be real with children, not to avoid the hard topics. On the other hand, I don’t want to scare or upset my readers. This balance was something I paid great attention to in the writing and the illustrations. To show the fear of losing Popola, I first showed Tashi’s love and special relationship with him. In that way, the reader can more easily identify with the fear of losing him. Overall, I felt a light touch to the subject would go a long way, so I didn’t dwell too long on the fears. I also used lyrical free verse and kept the illustrations colorful even in the hard times of the story. At first Popola doesn’t believe that the flower cure will work without the magic of his land and people. Why do you think it worked, even though the cure wasn’t performed in Popola’s Tibetan village? What is the importance of community in Popola’s healing? NCR: Popola was isolated, lonely, and sad as a Tibetan refugee in America. Like the man in the true story, Popola escaped Tibet and had to leave precious family and friends behind. He had suffered a lot. (In the true story, the man had been in a Chinese prison for many years.) In Tibetan culture, illness is often viewed as stemming from suffering of the mind and heart. So in Popola’s case, when people came together to help him, he began to feel cared for by the greater community, a new village, if you will. This lifted his suffering and therefore healed his physical illness. In the true story, when the doctor couldn’t explain the miraculous healing, the Tibetan man said he could explain it. He said disease can’t remain in a body filled with love. The flower cure is based in traditional Tibetan medicine. How did you research Tibetan medicine for this book? NCR: In my study of Tibetan culture and the practice of some of their traditions, I’ve learned their philosophy about life and illness and suffering. So when I came across this story, it made sense with what I had already come to know about Tibetan culture and it also made sense to my own sensibilities about healing. I had never heard of the Tibetan flower cure, so I asked many of my Tibetan contacts about this. I couldn’t find anyone who knew about it. Apparently, it was a tradition specific to the man’s village. I also researched Tibetan medicine online and in books. And finally, I had some Tibetan contacts take a look at what I wrote to make sure I had the cultural aspects right. The illustrations in this book are beautiful. What influenced your artwork? What was your process of creating these images? NCR: Thank you. I knew when I first had the idea for the story that I wanted the illustrations to be colorful and bright. My favorite painting style is impressionistic and I thought the flower theme would fit very well with that style. I actually spent several months studying the impressionistic style at deeper levels than I had before. I had books all over the house opened to pages of inspiring paintings. I read what the impressionistic painters said about their approach and style. I painted some of the famous paintings to get the feel. Then I spent many months sketching ideas and refining the design with my art director and editor. Their help was invaluable. Finally, I got to the most fun part—painting the illustrations! It is somewhat unusual for a person to be both an author and an illustrator. Do you feel that the writing and visual creative processes are similar? Are there any difficulties in being both a writer and an artist? NCR: I find my writing and visual creative processes feed each other. When I’m writing, I’m visualizing the illustrations. When I’m painting, I may realize something needs to be done differently in the writing. For picture books, it’s very freeing to know the illustrations can handle many details of the story so the writing can remain simple and crisp. I strive to have the illustrations and writing complement each other so they each have an important voice in the storytelling. The only difficulty in being both a writer and an artist is that a project takes me a long time to complete. But I wouldn’t trade it for the world. I love being involved with the full project. When you begin a new book that you are both writing and illustrating, which do you create first: pictures or text? NCR: I start with the story. The story lights up my imagination for the pictures. To help her grandfather recover, Tashi must understand the importance of her family’s background and culture. How would you encourage children to learn about the importance of their family’s culture? 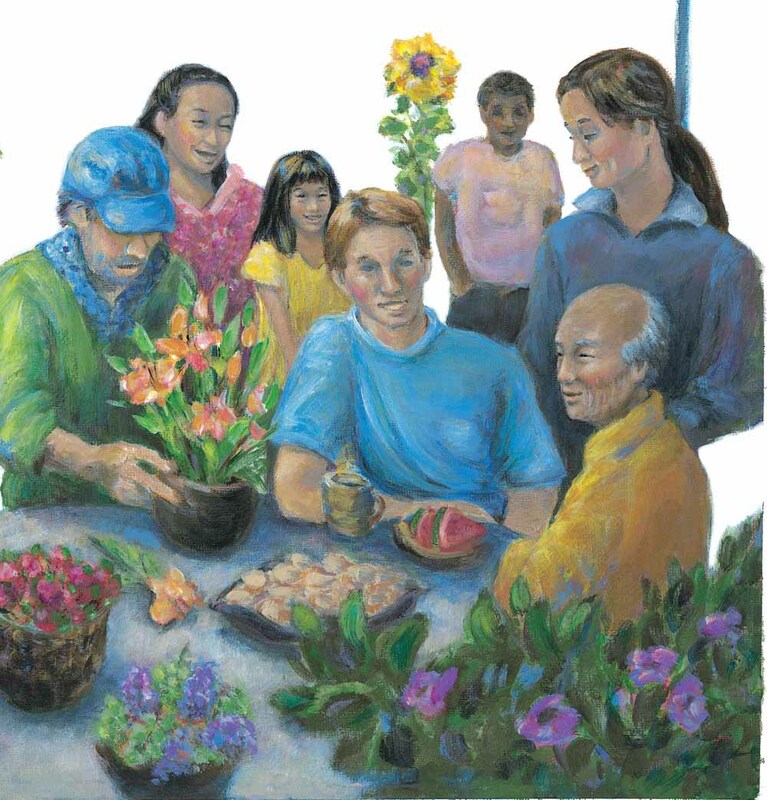 NCR: Tashi learned about her family’s culture through her relationship with her grandfather. I think this is so important for children—to have those special relationships with their elders whenever possible. Elders can offer much needed wisdom, care, and family information to our children. Also, Tashi asked questions. That’s a great thing for children to do with their families. It can bring a family together in a special way and a lot of information can get passed on. At the end of the book, you state that Tibetans who immigrate often face the challenges of preserving their culture, customs, and beliefs while adapting to American life. What are some of these challenges? What advice do you have for people hoping to overcome these challenges? NCR: I have great respect for how Tibetan refugees have worked together to cope with the loss of their homeland, their community, and the context for their culture. Overall, they have a loving attitude as they go about facing all the new challenges: learning a new language, making a living, adapting to an extremely different culture. Because of all these challenges, it could be easy to be so overwhelmed that they lose sight of their culture and customs. Because of all the “glamor” of American life, it’s easy for Tibetan children to be more interested in American ways and less interested in their own cultural heritage. One of the major ways Tibetans in the United States have addressed these challenges is to set up Tibetan cultural centers in many of the areas where Tibetan have settled. These centers offer classes in Tibetan language, Tibetan arts, and so on. They have regular activities that bring the Tibetan people together. These centers may also offer events for the public. Tibetans are very open to being part of the larger community, to being of service to that community, to sharing their culture with others, and to learning from other cultures. I think these cultural centers are a great example to others who have these kinds of challenges to overcome. What is a message that you want children to walk away with after reading your book? NCR: Acts of kindness can bring many, many gifts to others and to our world. NCR: I always have more projects! I have a special book about Tibetan wildlife that is just about completed. I’m working on a couple of chapter books with a Tibetan-American child as the main character. I’m also beginning the illustrations for my third and final book in my Tibetan Tales series.